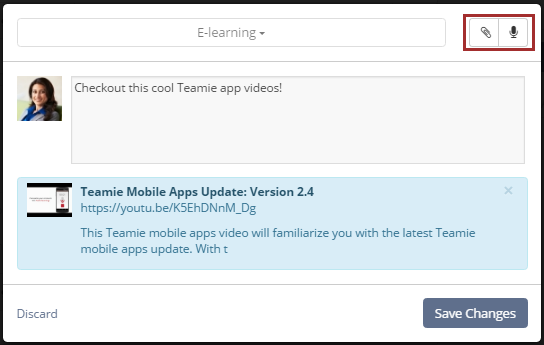 Using Post module, Teamie users (Instructors, Learners and Administrators) can create posts, read, comment and reply to comments, share their opinion on different topics, ask questions, share files among themselves, or work together on a specific task and lots more. The global Add button which is displayed as a plus sign (+) for its ability to add globally from any where in Dash. Just use it to add a bunch of important stuff anytime, anywhere. 1. 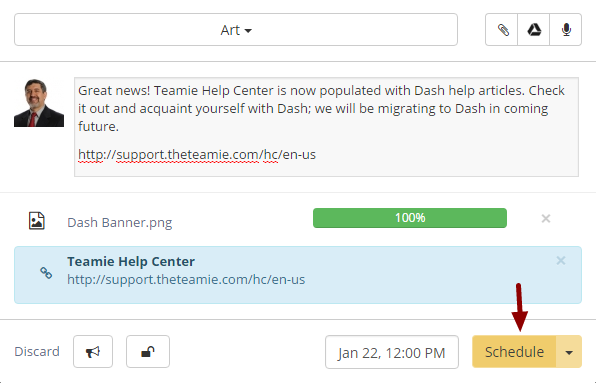 Click the global Add (+) which you can always find at the top-right hand corner in Dash. In case "Stories" features is enabled on your Teamie site, you will see a third option to create a Story. Note: Learners are allowed to add "Thought" and "Questions" posts only. 4. 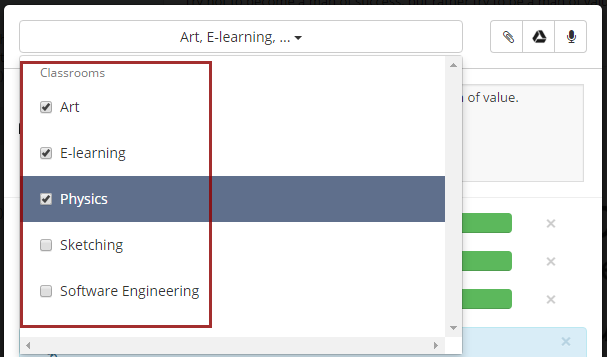 Select the classroom from the drop down list. 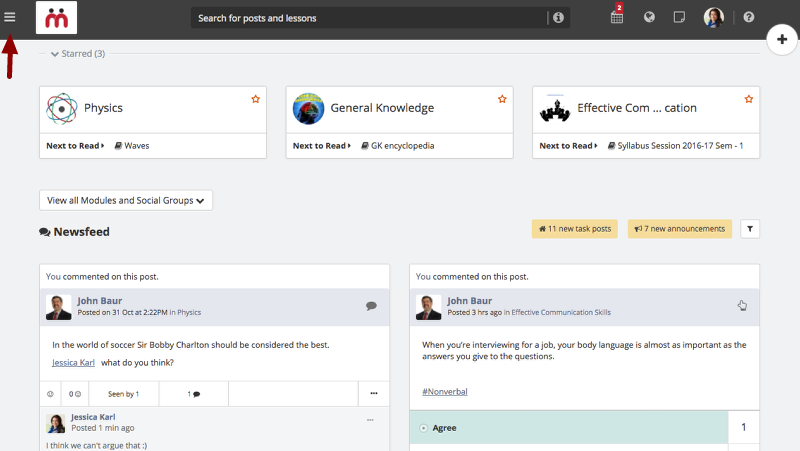 As an instructor, you can select one or more classrooms to share the post. 5. Type your thought in the text box. 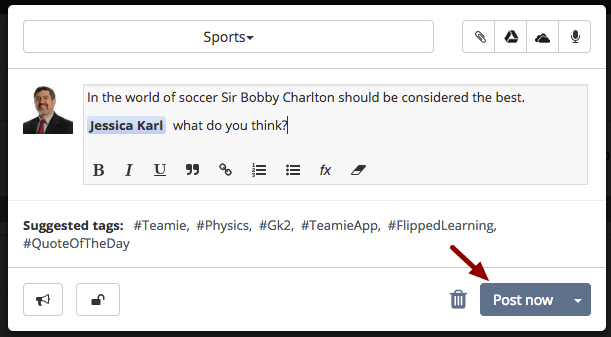 Note: Use hashtags to create easily filterable posts. 6. 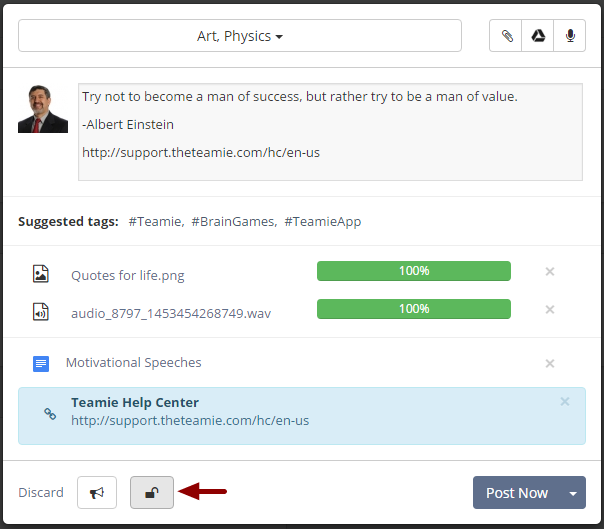 Click attachment icon and select attachments (images, videos and documents) to add to your thought. You can also attach stuff from your Google Drive by clicking on the Drive icon and selecting the required file. Make your thought interesting! Don't worry, we will show you how! Note 1: A progress bar will show you the upload progress of your attachment. Do not post the thought before the progress of any attachment is complete. Note 2: You can also drag ‘n’ drop file attachments for posts. Simply drag and drop files (or folders!) 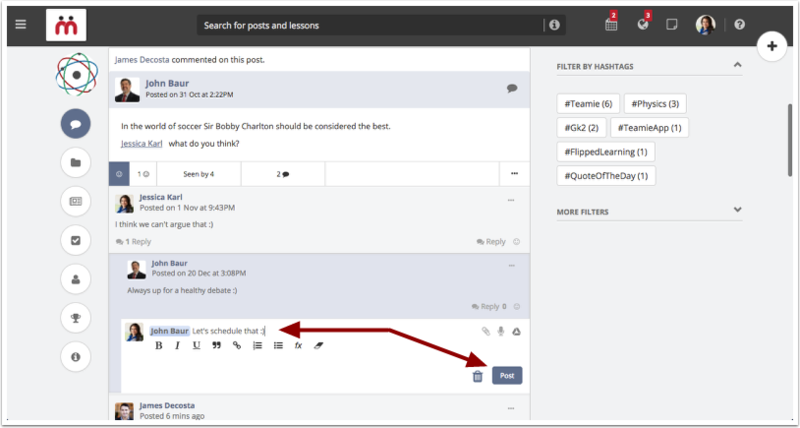 onto the post share box and they will get added as attachments to your posts in a jiffy! 7. 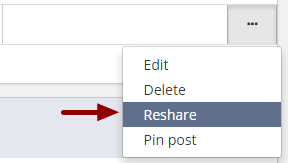 Paste a link in the post share box and it will get attached automatically to the post as a link attachment. Voilà! Note 1: If the text of the post or comment has some text along with the link, then the link will appear twice (in the post body and as a link attachment). User could have included the link in the text to provide some context specific information. If the text of the post / comment has only the link, then the link will be attached as link attachment and will be removed from post body or comment text. 8. 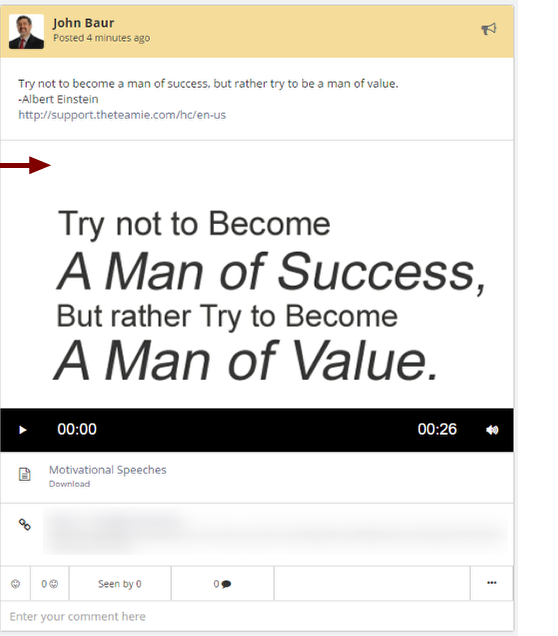 If you want to attach a recording (maybe a motivational speech) to your your though post, click recording. 9. Click Record to start recording. 10. Click Stop when you are done recording. 11. 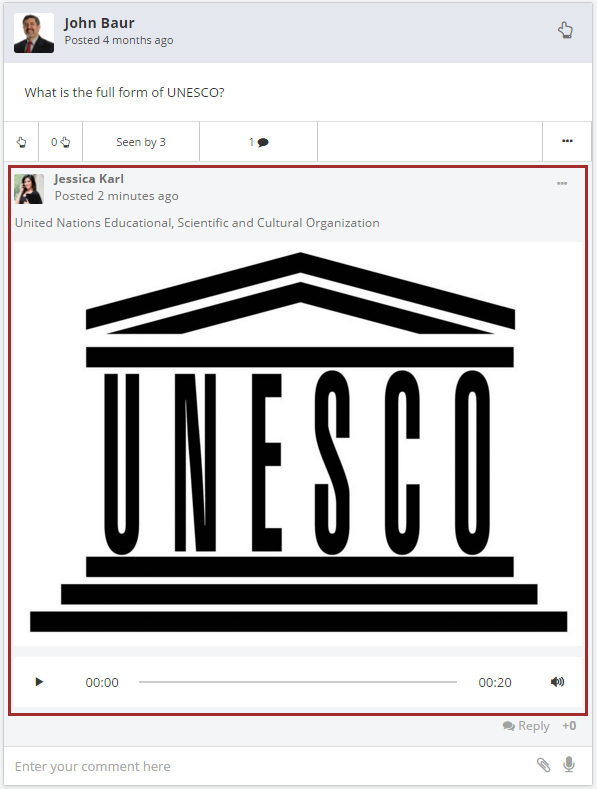 Click Upload to attach the audio recording to the post. 12. Your file will be attached after the progress bar reaches 100%. 13. 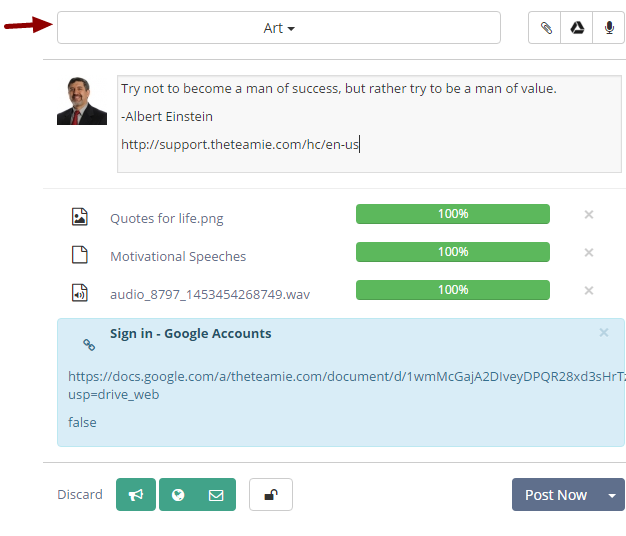 You can even add files from your Google Drive to your posts. For this, click Google Drive. 14. Click the required file from the Google Drive picker and click Select. Note: You can also pick your file from the Folders tab if the file you are looking is not from the Previously selected files. 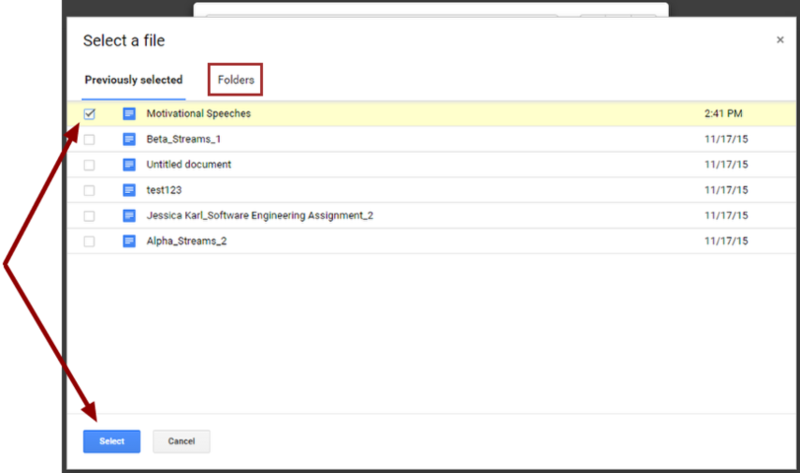 You can also select multiple files from your Google Drive to attach to a post. 15. Your file will be attached. You can remove the file by clicking X which appears next to the attached file. 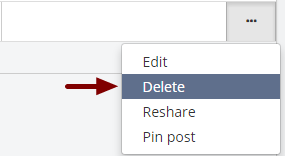 Note: Similarly, you can remove any attachment from the post or even discard the whole post. 16. Click lock in case you wish to lock comments in the post. 17. Click announcement to share this post as an announcement. 18. By default the method of announcement will be set as bulletin board notification. 19. Click Email if you wish to send the announcement both as an email and a bulletin board notification. 21. A confirmation message appears. The post will be posted immediately to the classroom's newsfeed. Mission accomplished! 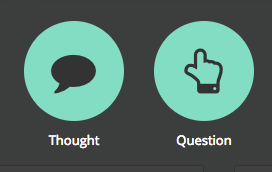 To create a question post, the steps are similar to adding a thought. 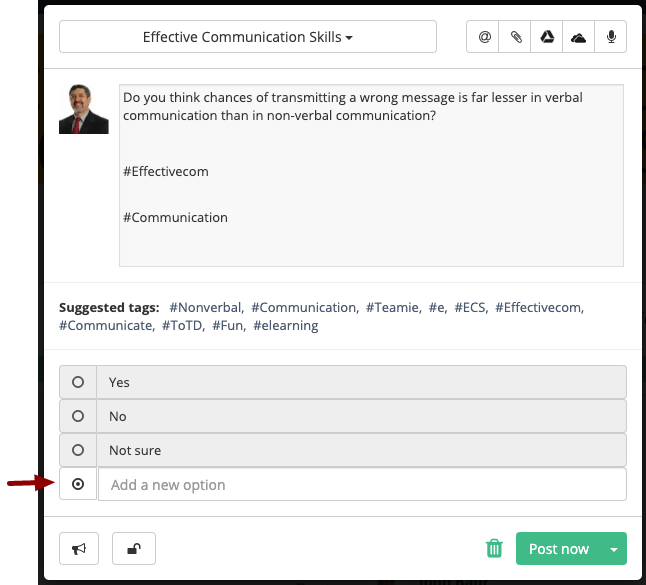 However, by using the Question, you can create a poll question quickly. Read "What is difference between thoughts and questions?" to learn more. 1. Click the global Add (+) at the top-right corner of the page and select Question. 2. 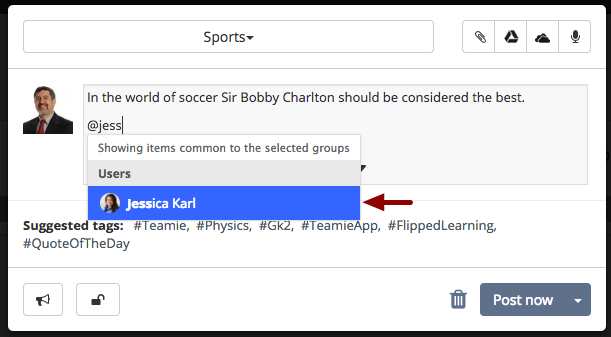 Click Share with and select the classroom from the drop down list. 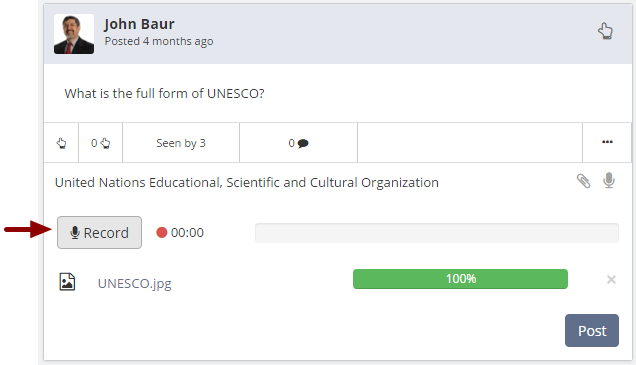 As an instructor, you can select one or more classrooms to share the post. 3. Type your question in the text box. 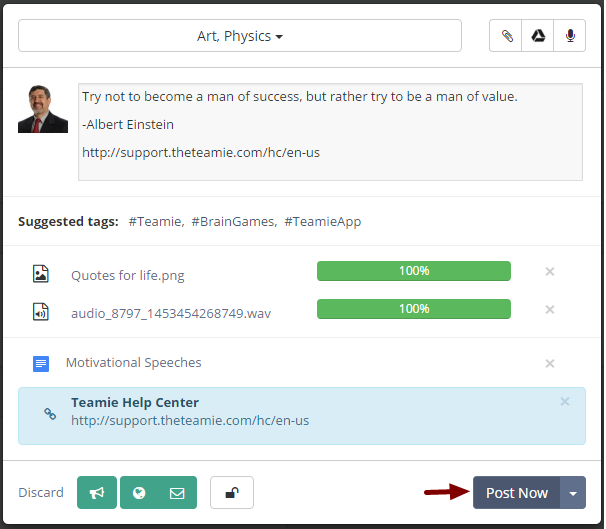 Note: You can also create a question with other types of attachments such as Link, Image, Document, Audio, Video, and recently used hashtags. For this refer to "Adding a thought". 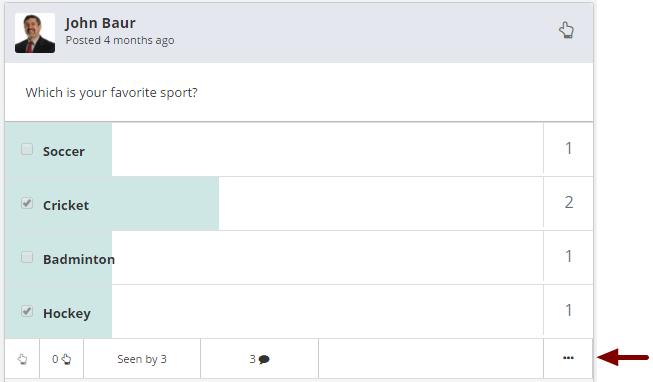 You can change a question to become a poll by giving options for user to vote for. 1. 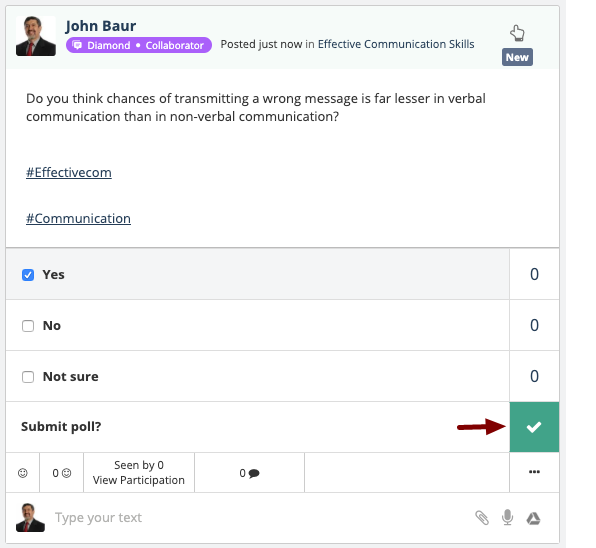 You can not delete/remove the poll options once users have voted on the poll. 2. You cannot create a poll with single choice/option, i.e, a poll must have atleast two choices/options. 2. Type in an option. 3. Simply press enter to key in another option. Similarly add other options. 4. 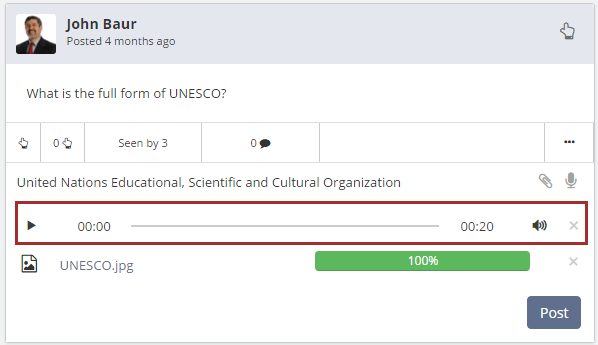 Click dotted circle to switch from single choice to multiple choice options for a poll. 5. 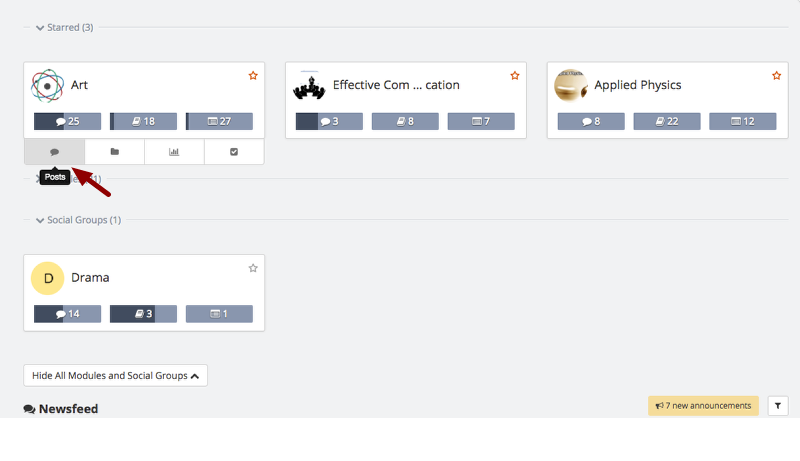 The radio buttons will change to check boxes and now the users can choose multiple options. Click Post Now. 6. The poll question will be posted on the classroom's newsfeed page. Poll takers can select one or more options and click on the tick mark to submit the poll. Note: Single choice will be mentioned for polls which will allow takers to select only one option. Whereas, Multiple choice will be mentioned for polls that allow multiple options selection. 7. Anyone having access to this poll can see the poll count (number of people who voted for an option) in the right hand column, once they submit their vote. Note 1: If someone has already taken the poll, their selected options will be seen as highlighted. Note 2: A poll can only be taken once. 8. Click on any options count to see the list of users who have voted for that option in the poll. 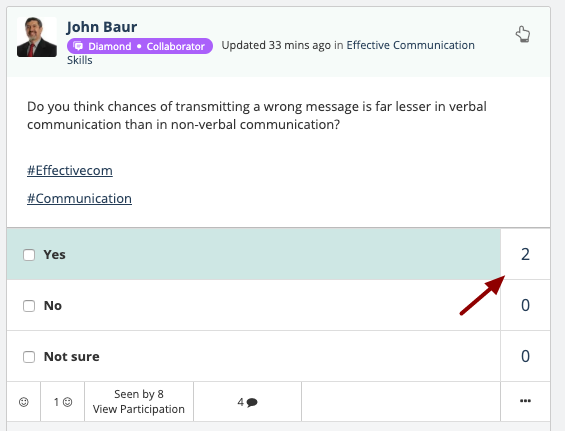 Instructors can see the list of users who have voted for an option in any poll. Whereas, a learner can only see list of users who have voted for an option in a poll created by him/her. By default, only post owner has the ability to edit/modify a post. An instructor is given additional permission to edit/remove any post shared by a learner in his/ her classroom, if he/she found the post's content inappropriate. 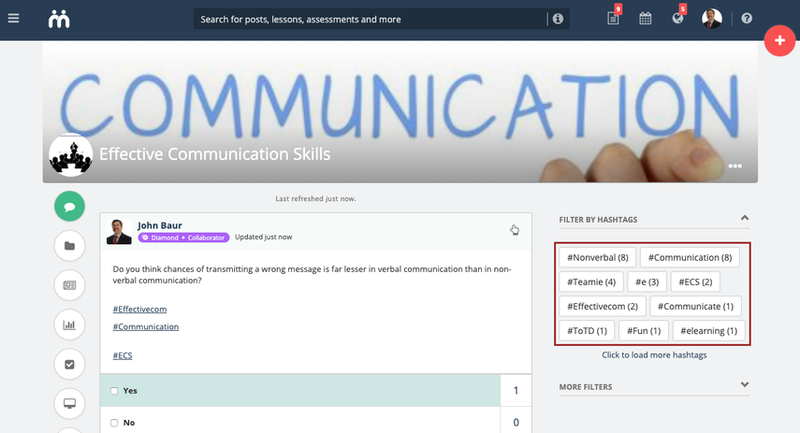 As an instructor you may edit posts to add more stuff to the post or just correct minor mistakes, add/remove attachments, modify the post text, edit poll/ add new poll options (poll options can be edited if no user has taken the poll yet), modify the deadline of the task’s post and so on. 1. To edit a post, click the ellipsis (...) icon and select Edit. 2. Edit post has its own set of actions. Edit your post as per your requirement. 3. You may add file or audio attachments, if required. 4. Click X to remove any existing link attachments. 5. 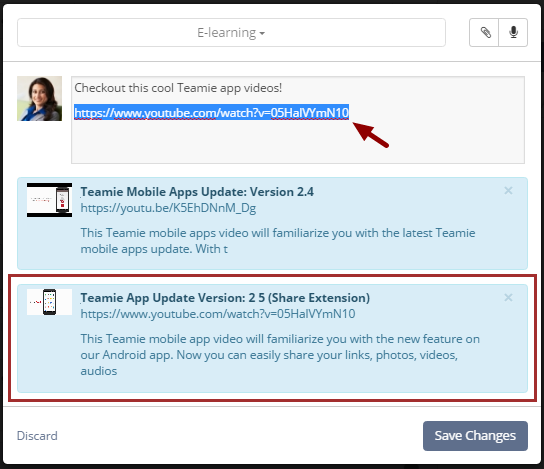 Or add new link attachment by pasting the link in the text box. 6. Click Save Changes to save the changes made to the post. 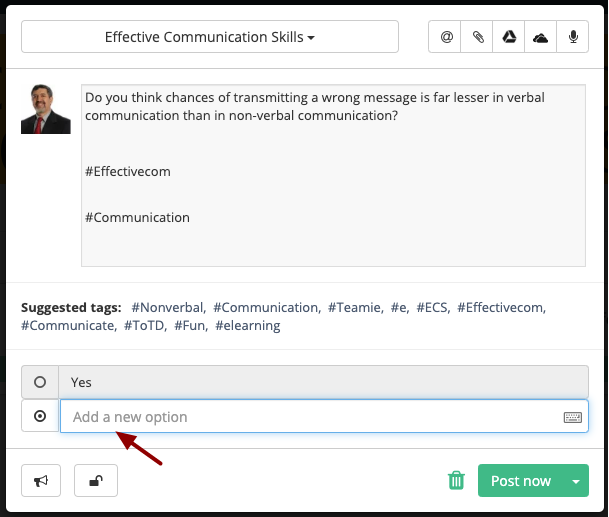 Or click Discard, if you have changed your mind regarding editing the post and want to retain the existing post. 7. 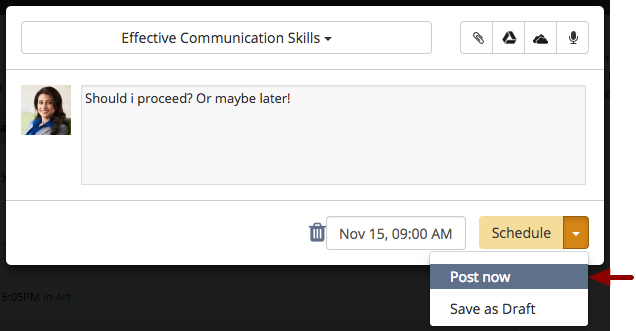 On clicking Save changes, a success message appears showing that you have successfully updated your post. 1. Click the ellipsis (...) icon for the post you wish to delete. 2. 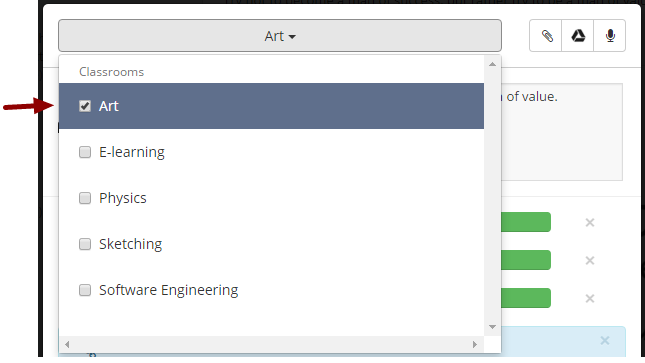 Select Delete from the drop down list. 3. Click Yes, Delete! to delete the post permanently. 4. A confirmation message appears. The post will be deleted. All gone! 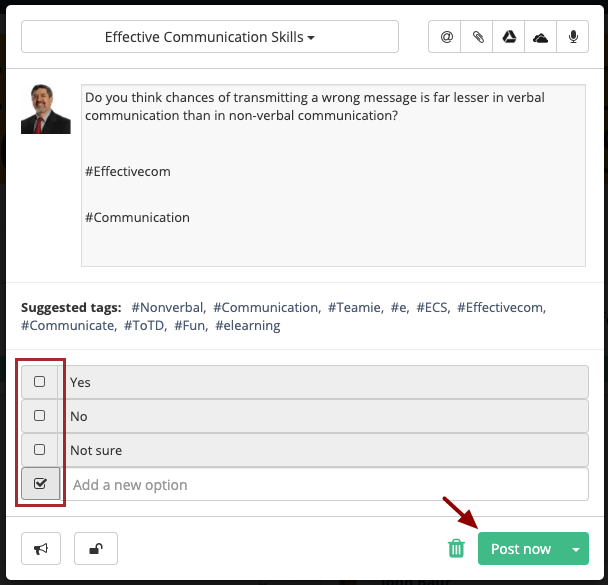 Adding comments to a post is easy as ABC if you follow the simple steps below. 1. Click the Comment box of the post you wish to add comment for. 3. 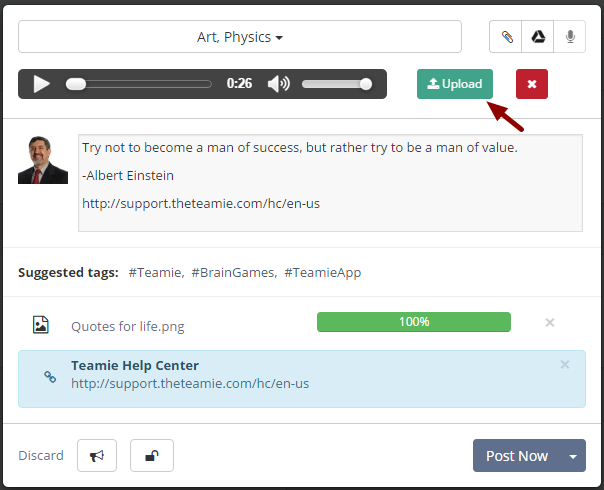 You have the freedom to add attachments and/or audio recording to your comments. Go ahead, make your comments exciting! 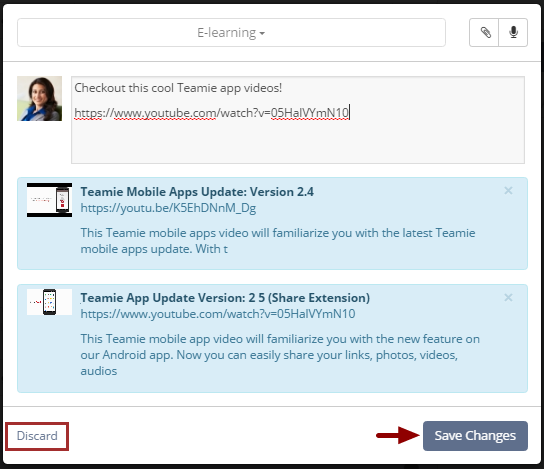 To add one or more attachments, click attachment and drag and drop file(s) to the comment box. 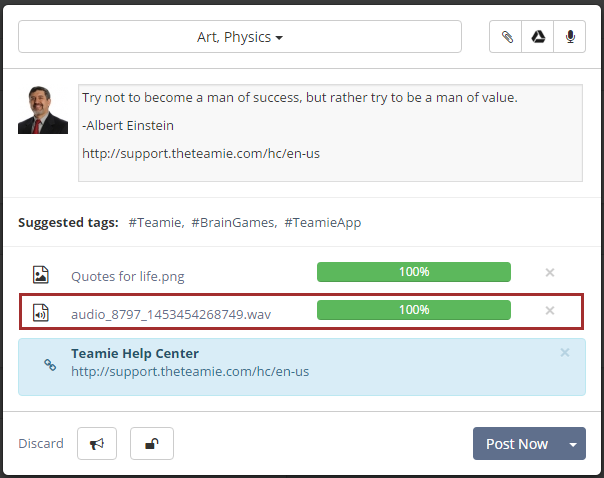 Note: You can add multiple attachments as well as audio recordings in your comments. 4. The file will be attached to your comment. Note: You can delete the attachment by clicking x. 5. 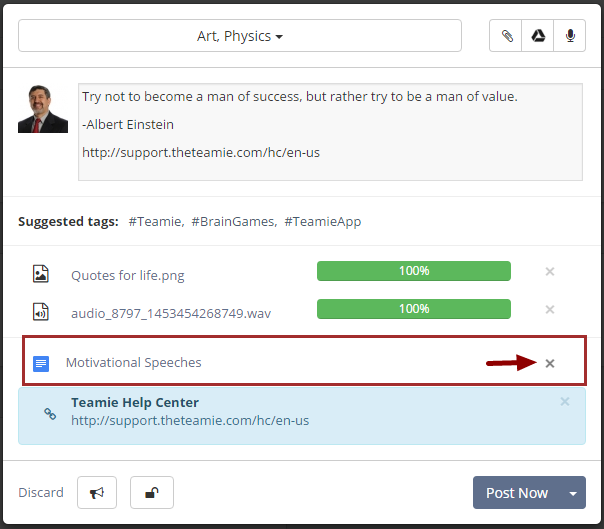 In order to add audio recording to your comment, click voice recorder. 6. Click Record and let your magical voice do the magic. 7. Click Stop when you are done recording. You can playback your recording in order to be sure, and delete the recording to record again if you think you can do better. 8. Click Post to add your comment to the post. 9. Your comment will be added to the post immediately. You can quickly reply to comments by following the simple steps below. 1. Click Reply on the comment you wish to reply to. 2. Type out your the reply in the text box and click Post. 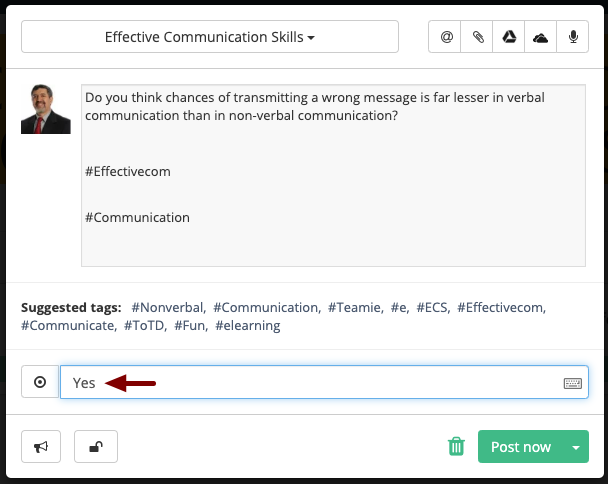 Note: You can also add file attachments and audio recordings to your replies similar to how you do while commenting on posts. 3. Your reply will be added and nested below the comment. 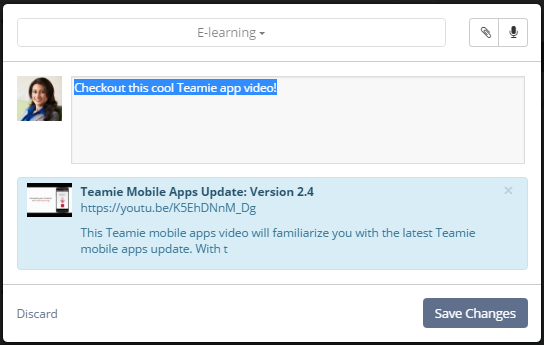 At one point or the other, you might have been engaged in some engrossing conversations on Teamie. One thing you might have missed would be the ability to reply on a comment, which is referred to as a comment reply, in a post. 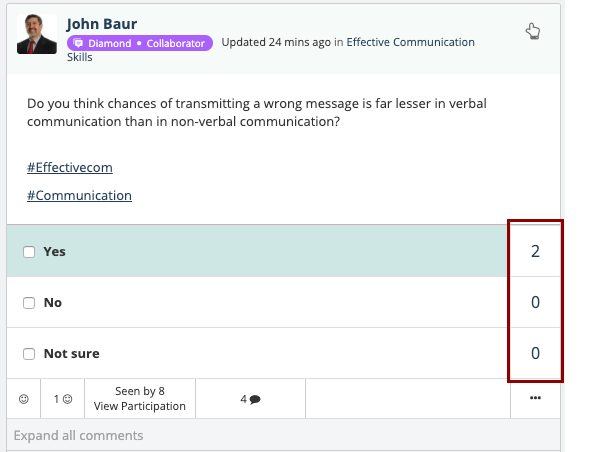 This can sometimes cause disruption in exchanging information as the user needs to click on a comments Reply button each time, even though they are actually referring to the previous reply. 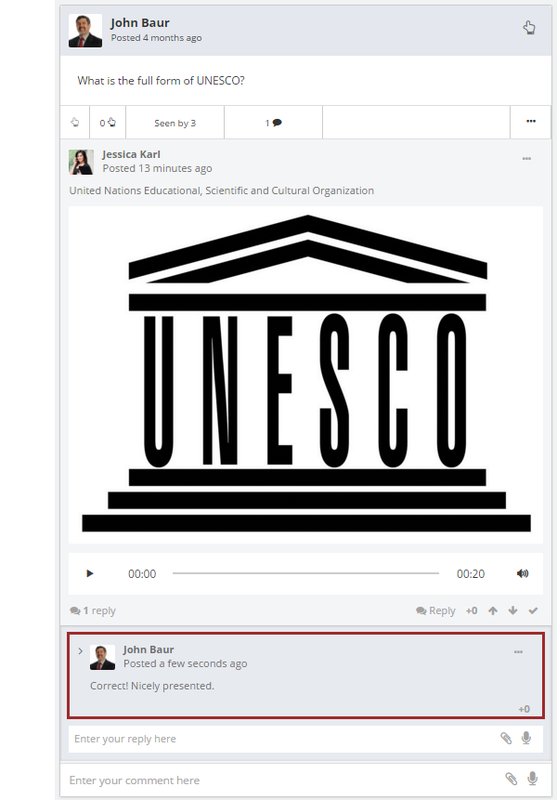 To solve this issue, we have now added a Reply button to each individual reply made on a comment. Let's see how you can reply specifically to a reply on a post. 1. Click the Reply count of the required comment. 2. 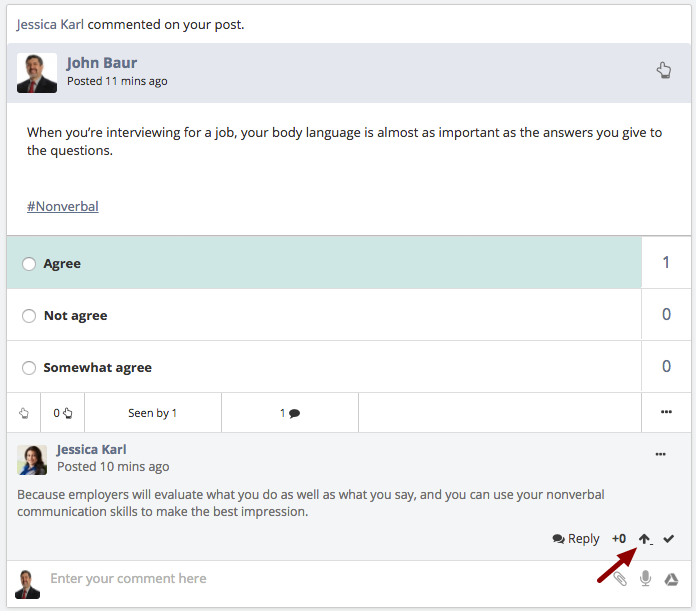 You will be able to see a Reply button on the comment reply. Click on it. 3. 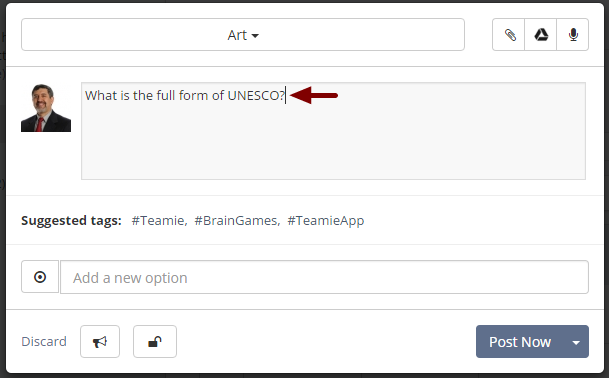 Moreover, when you click the Reply button, the owner of the reply will be automatically tagged in the new reply. Type in your reply and click Post. 4. The reply will be posted and the tagged user will be informed through a tagging notification. Resharing posts lets you share posts created by you or others in the classrooms of your choice. It lets you avoid the hassle of creating an already existing post which you need to share with a single or multiple classrooms. Note: Learners are not allowed to reshare post with multiple classrooms. 1. 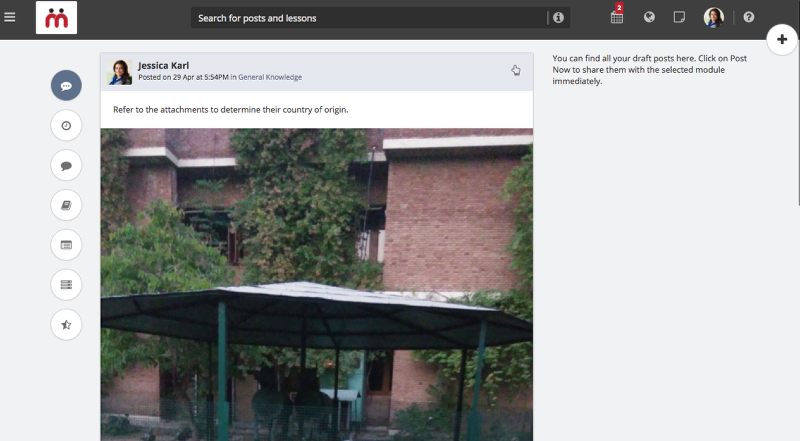 Click Posts of the required classroom. 2. Click ellipsis (...) of the post you want to reshare. 3. 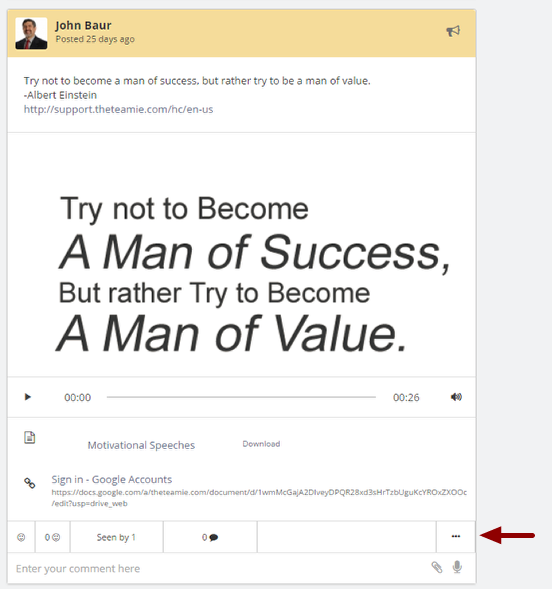 Select Reshare from the drop-down menu. 4. Click the Share with menu. Note: If required, you can edit the post before resharing it. 5. Select the classroom you wish to share this post with. Note: The displayed list of classrooms will be the classrooms you are associated with. 6. 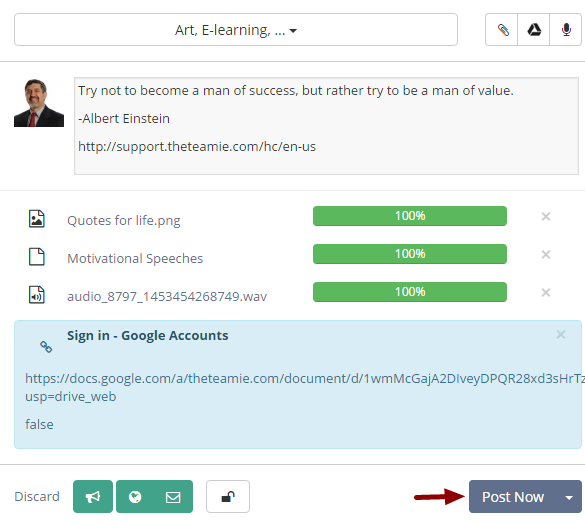 You can select multiple classrooms to reshare your post. 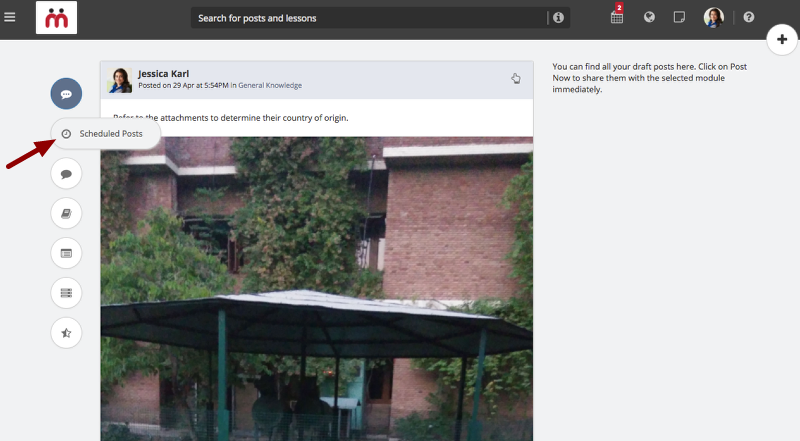 Note: Learners can select only one classroom to to reshare their post. 8. A confirmation message appears. The post will be reshared with the selected classrooms. This is what they mean when they say, "maximum gain with minimum effort!" Note: You will be considered the owner of the reshared post. You can mention users in your post. 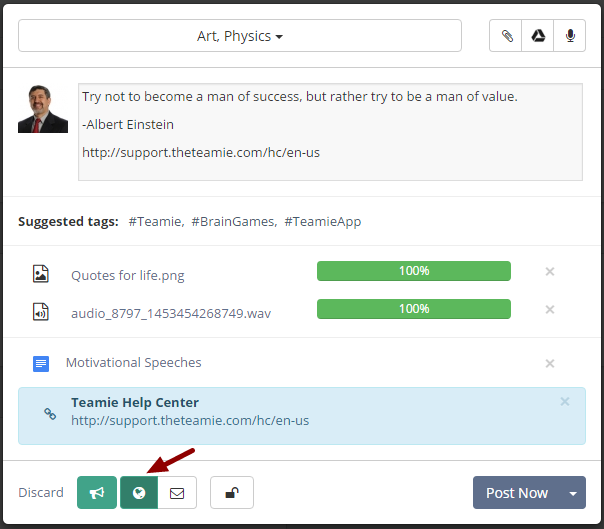 The users mentioned by you will receive notifications in their bulletin board. So whenever you think one or more users should certainly look at a post you are creating, try mentioning them! 1. 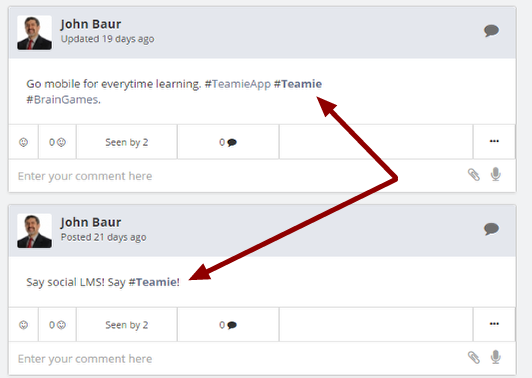 Type the "@" symbol in the post share box screen followed by the user's name to directly refer to specific users profile. 2. You will see a list of matching usernames. 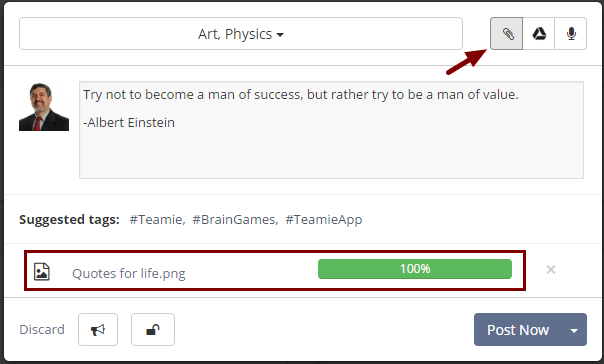 Click the desired username or simply press Enter to select the user you wish to mention in your post. 3. Click Post Now once you have finished typing out your post. 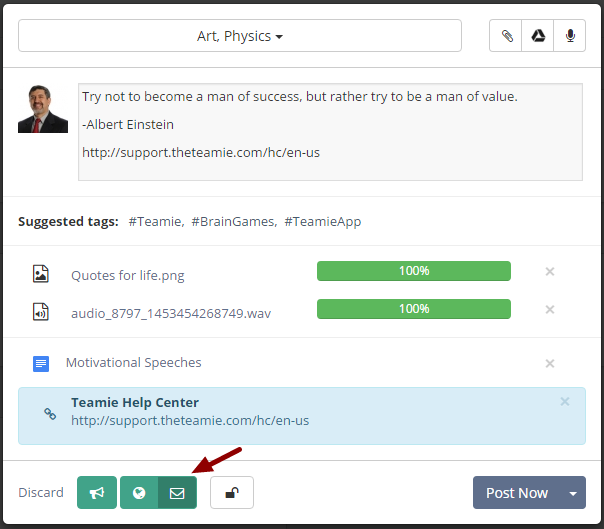 The mentioned user in your post will receive a notification in his/her bulletin board. 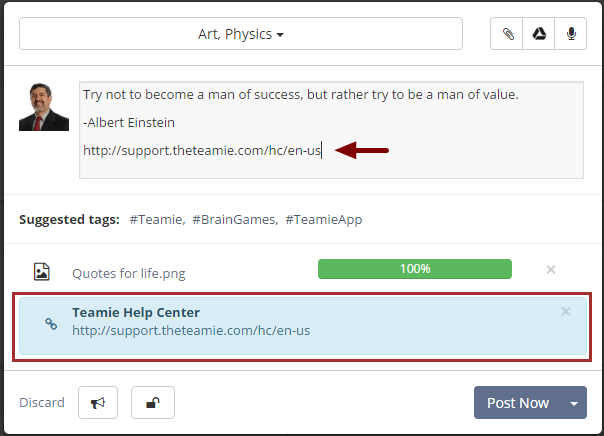 Read this to know more about tagging resources in posts. A hashtag is used to draw users attention as it makes it easy to find relevant content by search on specific hashtag, becomes a link to search and so on. 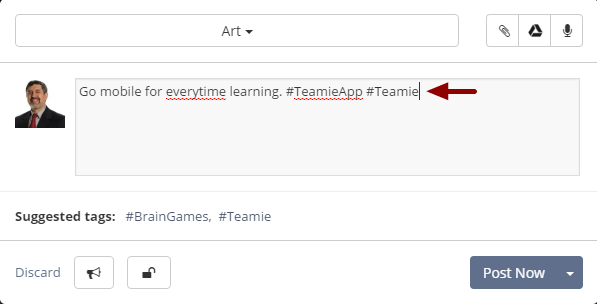 The hashtag works like a filter in Teamie to search posts on specific hashtag. The symbol of hashtags is "#". They make it easy to find relevant content by search on specific hashtag. You can use hashtags (also know as 'tags') to categorize your posts in Dash. You can filter your posts on Teamie based on specific hashtags. This makes it easier to find content based on their hashtags and thus capture users attention. Note 2: Click to use Suggested tags placed at the bottom of the post share box. These are the hashtags that are already used in some other posts created in the classroom and might interest you. So enjoy reusing the hashtags!. 2. Click Post Now to add your post. 3. 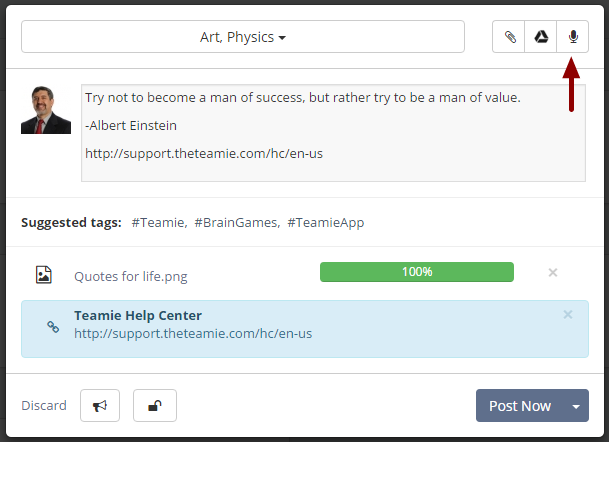 Teamie will create a link for each hashtag that you have added in your post. Posts that have the same hashtag will be grouped together. Clicking the hashtag will show all the posts that are marked by the hashtag. 4. The moment user clicks on this hashtag, they will be able to see all the posts in the classroom tagged with this hashtag. Read this to know more about filtering posts on the collated newsfeed. 2. 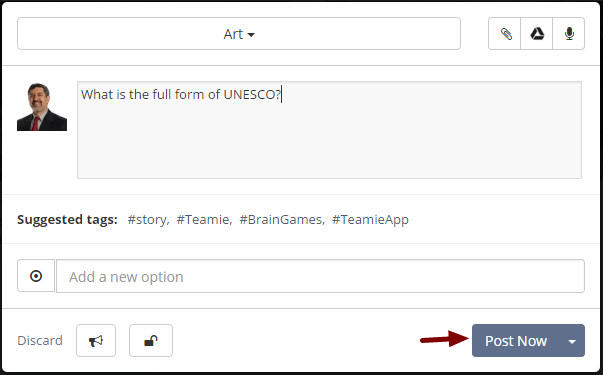 You will see a list of hashtag used in different posts under the FILTER BY HASHTAGS section. 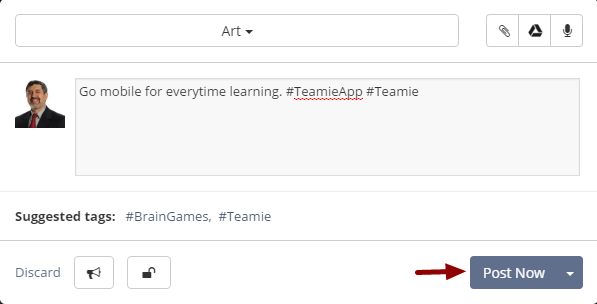 By default, the top 10 hashtags are shown in the filter section. A Click to load more hashtags link will be present in case more than 10 hashtags are there in a classroom. Clicking on this link will load the next 10 hashtags in the order of popularity and this process can be repeated to view all the hashtags in a classroom and quickly filter posts by them. 3. Click the hashtag on the basis of which you wish to filter the posts in this classroom. 4. 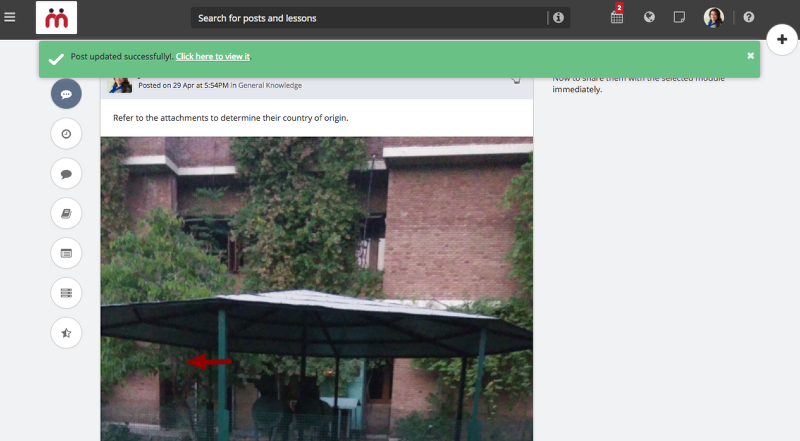 All the posts which are tagged with this hashtag in the classroom will be displayed. Isn't it #Awesome! You can reset the applied hashtag filter by clicking the reset icon. Also, posts can only be filtered on the basis of one hashtag at a time and multiple hashtags cannot be selected to filter posts by them. You can vote up comments and the replies on the comments made by others in a "question" post. 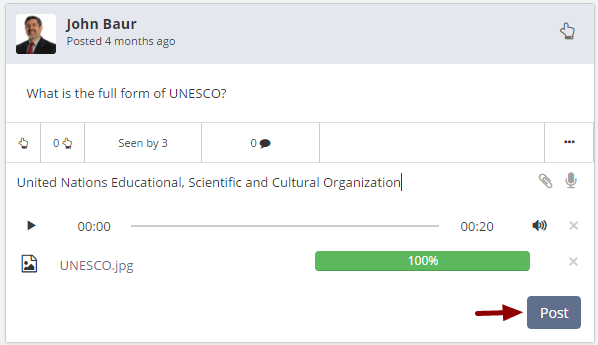 By voting up, you can indicate the comments are useful and appropriate. This way the owner of the comment will know that his/her comment is appreciated and would encourage him/her to comment useful content in the future also. 1. Click Vote Up to vote the comment that you wish. You can vote up as many comments as you wish in the newsfeed. However, you can only vote one time for a comment in the newsfeed. 2. The number of votes received by the comment is shown in the vote box. 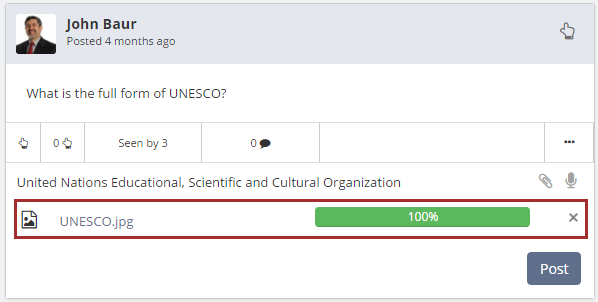 The author of the comment will be notified when someone has voted up his/her comment. Sometimes you start creating a post and decide to leave it in between (maybe due to some urgent work or it might just be that you don't have your thoughts organised yet). 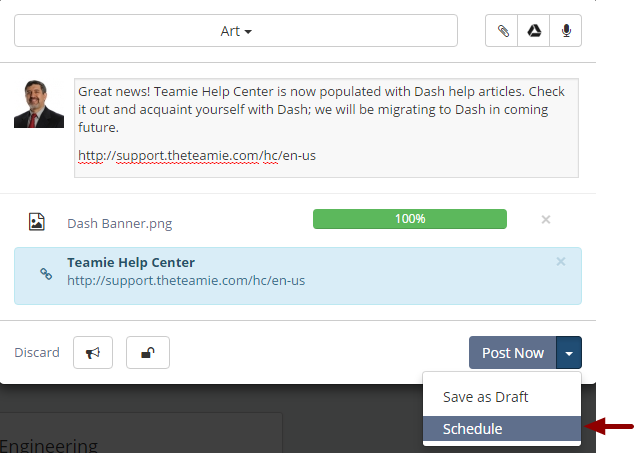 For such scenarios Dash provides a wonderful way out, that is, "Draft Posts". 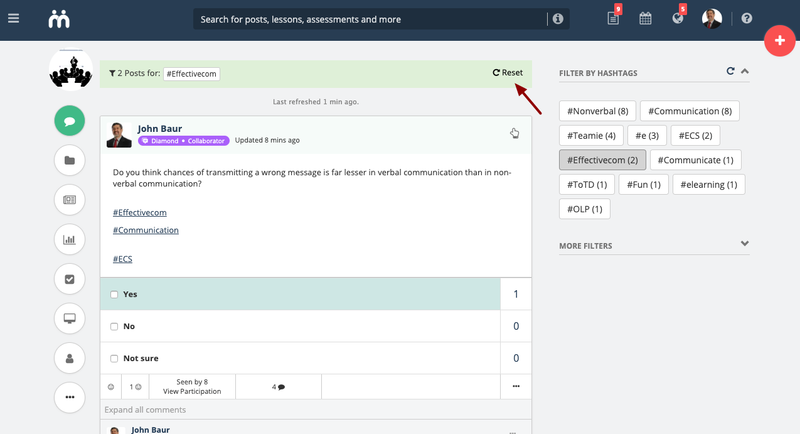 Create a post and save it as a draft post and publish it later by accessing it from the locker. 1. Add a post (thought, question or task). 2. 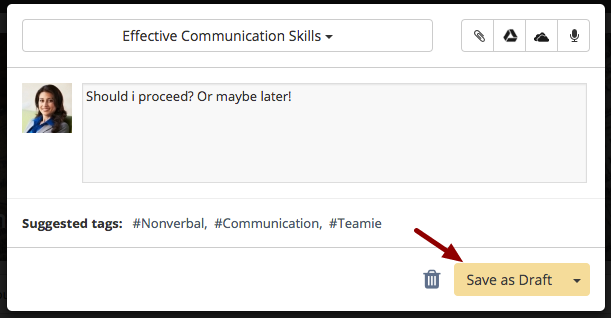 Click Post Now down arrow and select Save as Draft from the drop-down list. 3. Click Save as Draft (After you have made up your mind to create a Draft post). 4. A confirmation message appears. 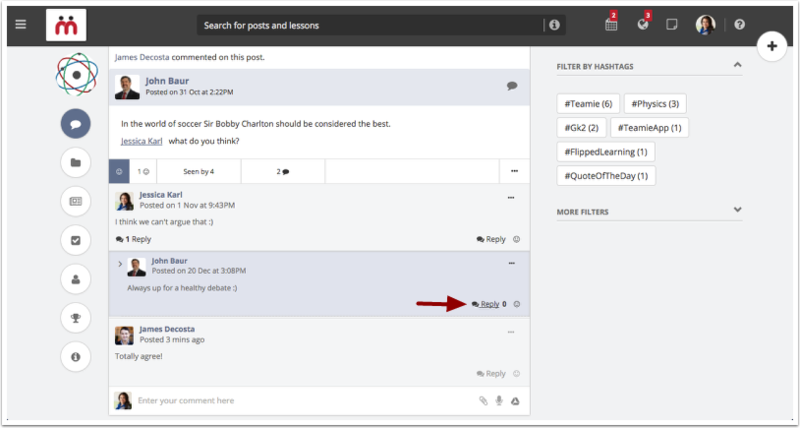 Your draft post is created and safely put into your locker. Note: You can click View your draft posts link in the confirmation message to access the draft post. If you are feeling lazy like we all do sometimes and don't even want to select and click Save as Draft after adding the post, then just click anywhere other than the post creation box. Voila! The post will be saved as draft automatically. 3. We present to you, your Dash Locker! By default the draft posts will be visible on the Locker landing page. 5. 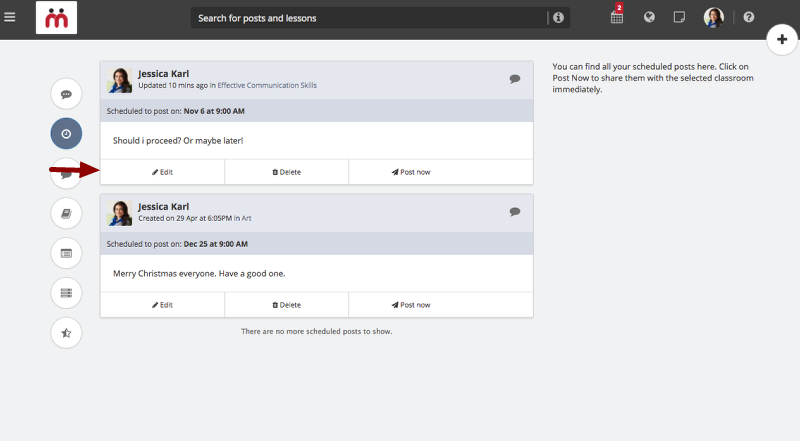 Now you will be able to view the posts you have scheduled to be posted at a later time. 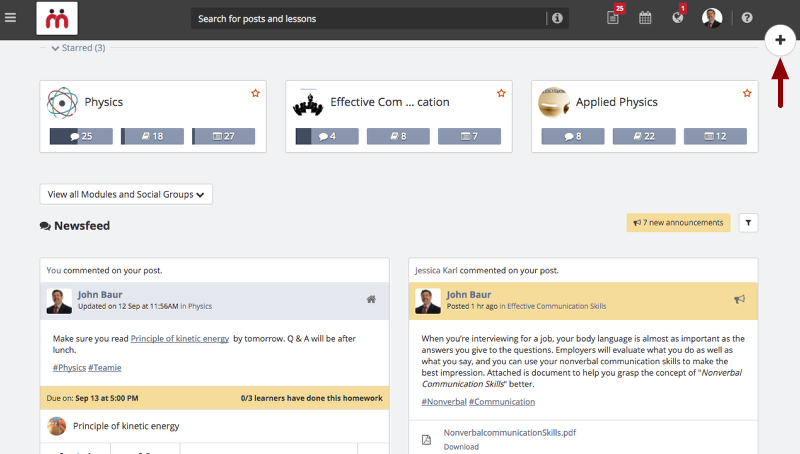 Similarly, you can access your "Locker Posts", "Locker Lessons", "Locker Assessments", "Locker Rubrics", "Grade schemes" from respective tabs in the Locker. 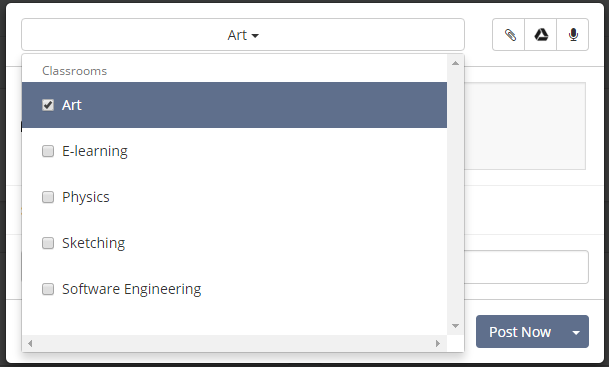 You can edit the content of your draft posts. You can also post your draft post or make it a scheduled post. 2. Click Edit of the required draft post. 3. The post share box opens. 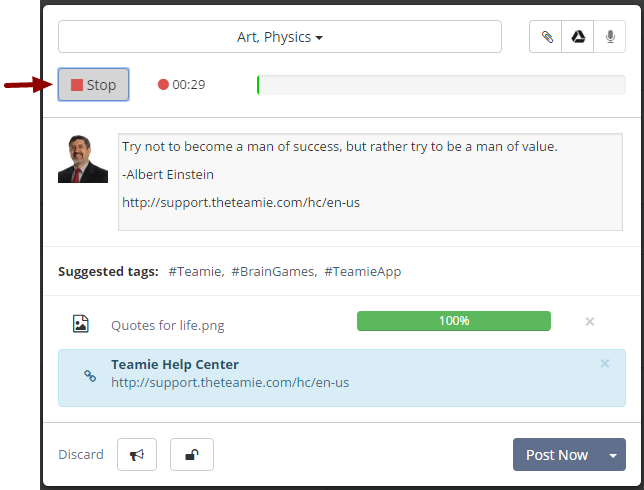 Edit the content of the text, add attachments or lock comments. Note: Learners are not allowed to share a post as an announcement. 4. Click down-arrow which appears next to Save as Draft label. 5. 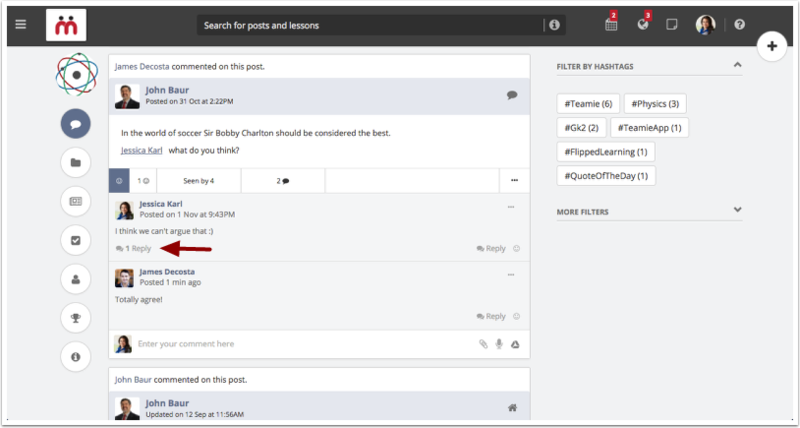 Select Post Now from the drop-down menu to publish your draft post. 6. Now click Post Now to publish your draft post to the newsfeed. 7. A confirmation message appears. Once the draft posts are published, they no longer appear in the Locker. 8. The draft post will be available in the classroom's newsfeed it is shared with. 9. 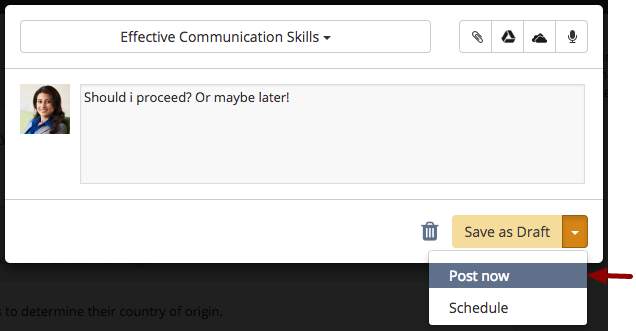 In case you wish to convert your Draft post into a scheduled post, select Schedule from the drop-down list. 10. Edit the post and click Schedule. 3. You will be asked to confirm if you are sure about deleting the draft post. Click Yes, Delete!. 4. Pufff! Gone! A confirmation message appears. 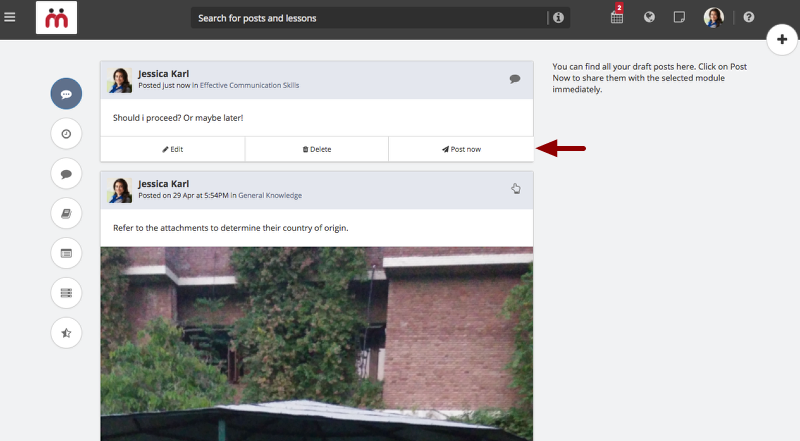 Your draft post will be permanently deleted and won't be showing up in your locker from now onwards. 2. Click Post now of the required draft post. 3. A confirmation message appears. 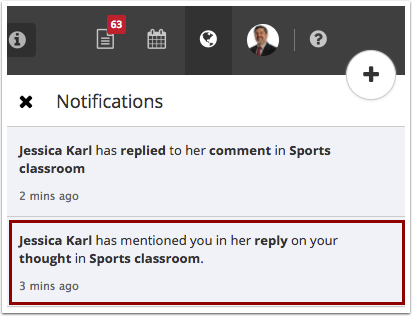 The draft post is shared with the corresponding classroom. Note: Once the draft posts are published, they no longer appear in the Locker. 4. The post will now be visible in the classroom's newsfeed. 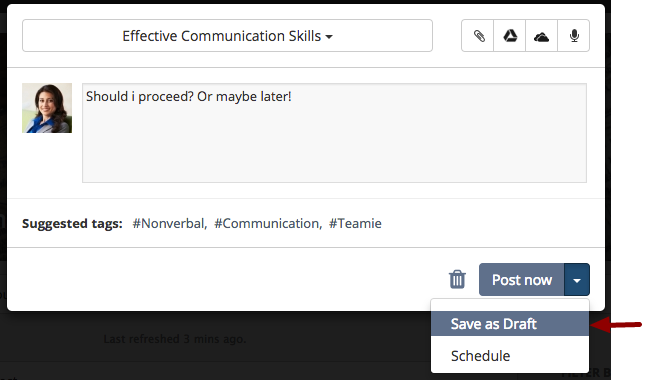 Schedule post gives you the ability to schedule your posts for a future date and time. 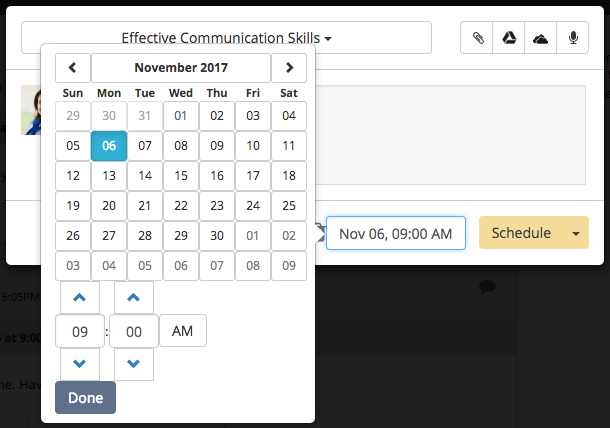 You can create any post and decide a suitable future date and time for the post to be shared to the required classrooms. The scheduled post will be shared automatically at that time. For instance, you find some free time on your weekends and decide to create a post that you need to share with your class on Monday, 8 AM. All you need to do is create a post and schedule it to be shared at 8 AM on Monday. This way you get to utilize your free weekend time and have one thing less to worry about on the usually hectic Mondays. 1. 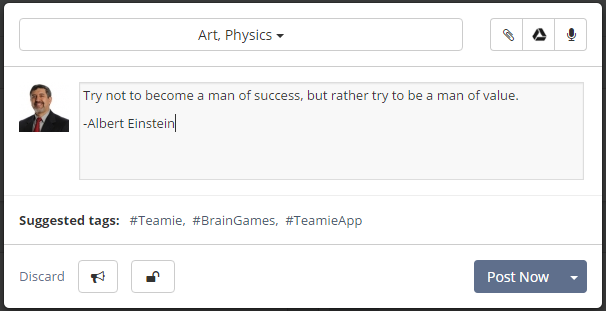 Add a post (thought, question or tasks). 2. 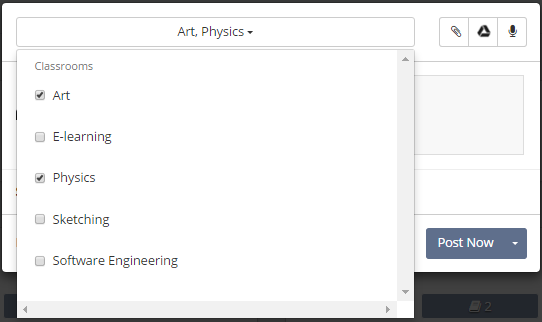 Click Post Now down arrow and select Schedule from the drop-down list. Note: You cannot schedule a post with more than one classroom. 3. Click the Date and Time stamp. 4. 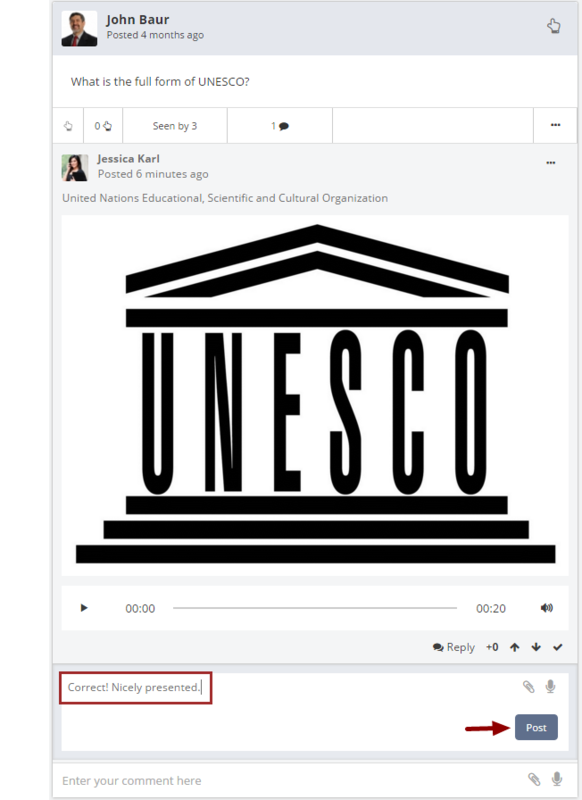 Set the date and time at which you want your scheduled post to be shared in the classroom. Then, click Done. Note: Alternatively, clicking anywhere outside the post share box will also schedule the post. 6. A notification message appears at the bottom left corner of the page. You can click View your scheduled posts to view your schedule posts in the locker. 3. Click Edit of the required scheduled post. 4. Similar to the draft post, the post share box opens. 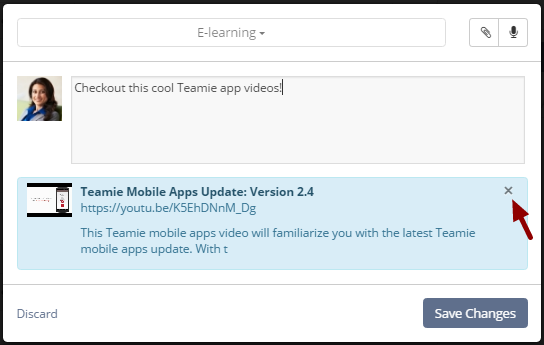 Edit the content of the text, add attachments, lock comments or make it as an announcement. 5. 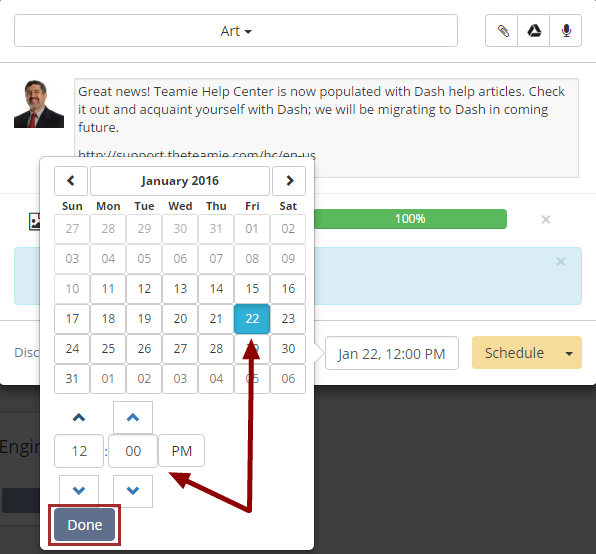 You can also change the date and time of the schedule post to any future date and time. To do this, click the date and time stamp and set the required time. Don't forget to click Done. Note: You cannot schedule a post for a past date and time. 6. Click Schedule to save the changes you have made. 7. A confirmation message appears. 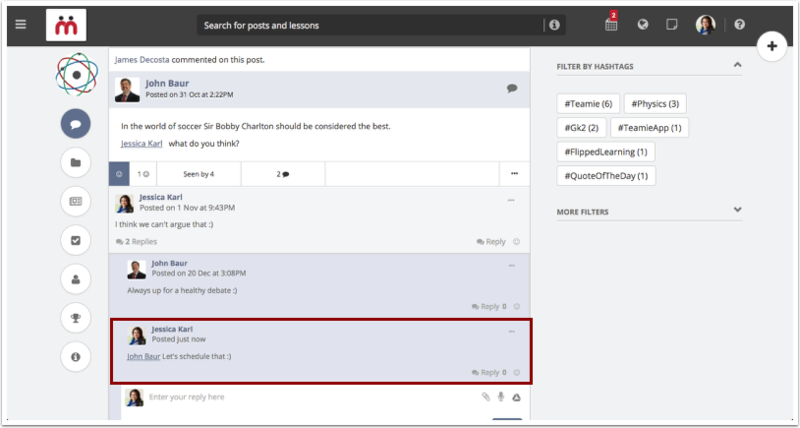 Your schedule post will be updated and shared automatically in the assigned classroom on the given date and time..
8. 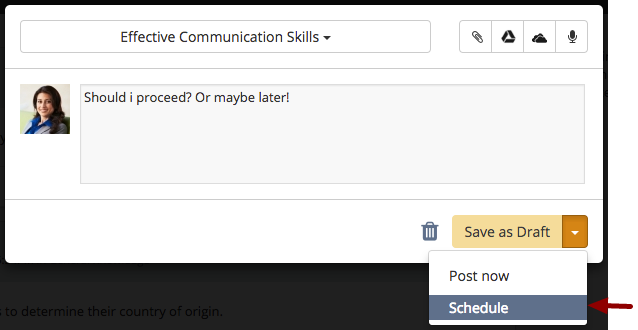 In case you wish to share your scheduled post immediately, select Post Now from the drop-down list. 9. Now click Post Now to share your scheduled post to the newsfeed. 10. 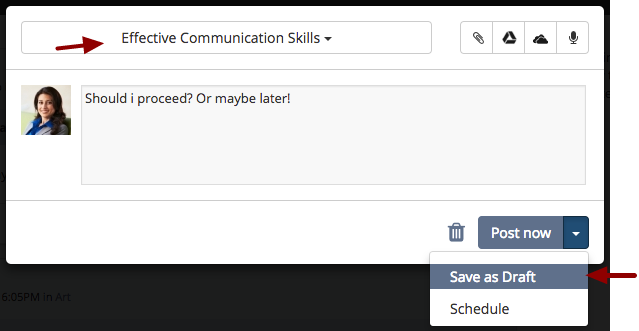 To convert your schedule post into draft post, select Save as Draft from the drop-down list. 11. Click Save as Draft to update your post. 12. It will now be available as a draft post in the locker. 2. Click Delete of the post you wish to delete from your locker. 3. You will be asked to confirm if you are sure about deleting the scheduled post. Click Yes, Delete!. 4. Pufff! Gone! A confirmation message appears. Your scheduled post will be permanently deleted and won't be showing up in your locker from now onwards. 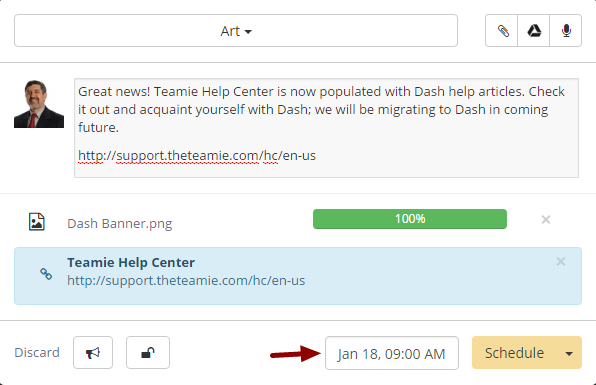 In case you wish to share a scheduled post before its scheduled date and time of publishing, then use Post Now option to share the post immediately. Let's see how you can do it. 2. Click Post now of the required scheduled post. 3. A confirmation message appears. The post will now be visible in the classroom's newsfeed.